Two artistic souls have met. But artists must support each other, so Martina, an artist in her own right, wanted to give her a chance to take the exams. She arranged classes with the academic painter Renata Kaiserová, who prepares applicants for graphic schools. 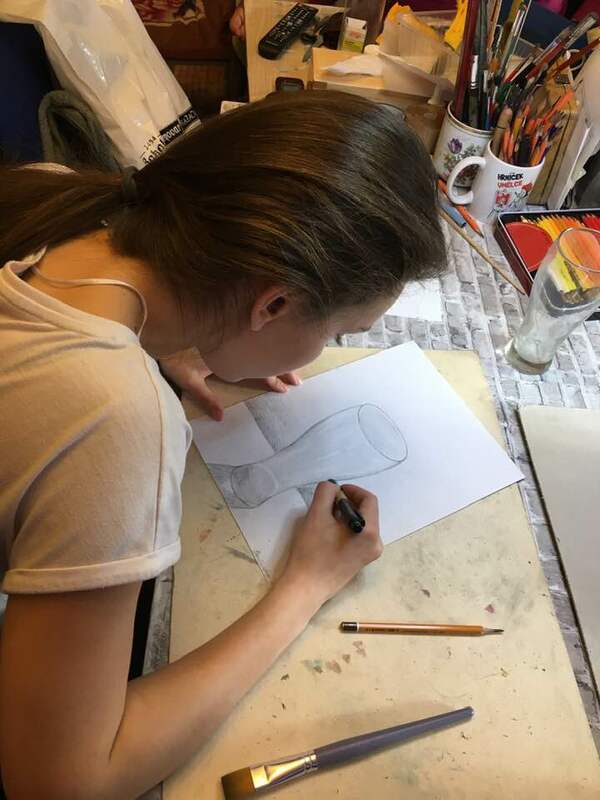 The lessons are funded by the Chance 4 Children Endowment Fund, which also bought a set of acrylic crayons for Veronika, which she needed to attend the classes. And as the saying goes – birds of a feather flock together. Martina got the offer to take Veronika to the design school, where she has been given the opportunity to attend real lessons. Are you asking, which school? Well, C4C started to cooperate with „Střední škola řemesel a designu Kladno“, whose director, Ing. Jana Bláhová, willingly opened the door for children from children’s homes. Thanks to her helpfulness, Verča has been given the opportunity to come and observe the lessons, to have her work assessed and being advised how to prepare for admission. Martina is now supervising her during the period until the exams: they take walks together around the city of Kladno, observing the important buildings and sights for inspiration and Verča will also come as a hosting painter to Martina´s own painting class, for this is her field of art, where she herself can prepare Veronika for the exams – as her current graphics are not enough to be admitted. Verča has to work hard – entrance exams are coming. Fingers crossed. We hope she will manage. Her pioneering work is important- it can show other children that everything is possible, and, as the age old adage (and Rolling Stones hit) goes : „You can make it – if you try…“!